Another week starts, and therefore so does another Fabricworm Giveaway! 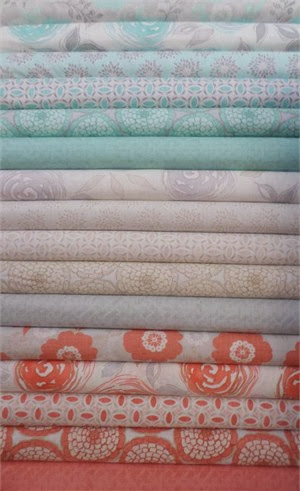 This week we're giving away a fat quarter bundle of Modern Roses by Moda! Check out the entire Modern Roses collection here. This giveaway ends on Sunday 11/24 @ 9am PST. The winner will be contacted shortly after by email. The winner will be chosen by random.org through Rafflecopter. Hmmmm....either a lap quilt or these could look good added to my Dear Jane stash. If I understand this correctly, once you sign in to Rafflecopter, you need to have a Facebook name before you can actually enter the giveaway. If this is the case, it means that people who don't have or don't want to be on Facebook cannot enter the giveaway. Seems rather unfair to me but perhaps I am wrong and you can enlighten me because the Rafflecopter website is no help at all. I'd make a sleeveless blouse out of the ecru ones; not sure what I'd do with the others. I don't do facebook so by doing that as the first option on rafflecopter I can't progress thru the other options. From the other's I take it one is what would you do with this line - My granddaughter will be 4 soon and some pretty dresses would make her very happy. These fabrics would look great as a quilt in my guest bedroom. I think these would make lovely blenders for a girly quilt! I would hoard some of them for my future grey/teal/aqua quilt and use some in other quilts and maybe make something for my daughter (20months). These are the exactly colors in my daughter's nursery! Such lovely fabric. A quilt or pillows would be nice. Maybe something for the bedroom or wait for an inspiring idea! HELLO, I'D MAKE A NEW BED QUILT+MATCHING PILLOWS! THANKS! I would use this bundle to make something sweet like a doll or stuffed animal for my daughters first Christmas! Looks like a beautiful quilt to me! These would be used for something for me, probably a throw or a tote! My sisters graduation present quilt! I'm wanting a new throw for me and this would be beautiful. I would make a quilt for my niece who is graduating to be a nurse this coming year!!! The colours areerfect for her! I'd make a beautiful summer quilt with this gorgeous fabric. Quilt for my grand daughter. Fabric is beautiful. Thank you for the chance to win it. Oh these fabrics would definitely go into a quilt. They are gorgeous. Hope I am a winner! for a project at home. I have some friends with little girls I would like to make quilts for. Love, love, love this! Pastel wonderfulness! I'd make a pretty quilt to brighten up the cold and dark winter days ahead! I'd make a lap quilt in perfect colors to carry from winter through spring. Lovely line!! This would make a pretty vintage style baby quilt. Project Linus - pillow cases and a wee quilt. I'd love to make a scrappy sprout quilt. A tote bag as a Christmas gift! I would make my sister a quilt. Love the soft colors! They'd look great in a quilt! These would make a lovely quilt. I would make a quilt for a guest bedroom. This range is so soft and calm without being overly girly. These would make great totes andor a lap quilt. Thanks! I would put them in a soothing quilt for my daughter. Thanks for the opportunity to win! I love fabric! Maybe for a.table runner. I'd make a quilt or some bags. It would make some pretty bags, that's for sure! I would make a quilt for my daughter-in-law because she loves pretty colours like this and I haven't made her a quilt in awhile. It would be a great Christmas gift. I would make a handbag and a diaper clutch for my cousin to welcome her new bundle of joy! i love it all your fabrics!! Um, I'd stash them. Is that too boring? A banner for my daughter's room. Love it!! These would make a beautiful quilt!! Thanks for the chance to win! I would use them to make quilt tops for my group, World of Charity Stitching. Having two spare bedrooms now my children have moved out of home, it's time for some guest bedroom makeovers and some guest bedroom quilts, so that's what I would do with this beautiful fabric. It would make a lovely quilt! I would like these fabrics to begin sewing cloth teething rings for my son. Beautiful- I would think of something! Ooooh, they're all soooo pretty! I'd make some bits and pieces for my little girl! I'd make a quilt for my daughter, Julia - she would LOVE these fabrics! Great selection. I love your store! have a couple projects in mind, an ironing board organizer, triangle tablet pillow holder, tablet cover are just a few in mind. The greys would go with another project I am getting grey fabrics together for a Dresden quilt. and the Aqua and salmons would have some more of the same from my stash added to it to make a throw for my Mom. And the left over scraps would make a new tablet cover for me and a new journal cover to match. And anything else left over would go towards mug rugs and the scrap containers. Thank you for the chance to enter your giveaway. I'd be making baby quilts with this gorgeous fabric - for all our friends having babies soon! The grays and aqua would go perfect with my baby memory quilt I'm working on. I think I'd also make pillows for my mom and sister. These fabrics would make beautiful baby quilts. oooo, pretty! They'd make some pretty littel zipper pouches! A quilt and skirts or dresses for my little girls. I love these fabrics! They would be perfect for baby quilts for my friends who are expecting. I have a little girl's room to design and these colors would be a great spring board! I love the colors in this line. I would live to make some cute kitchen products, maybe some embellished towels and hot pads, using this line. Quilt for my mother in law! I will make a quilt for my niece ...I love it !